You will be given a reference e-book to read which has 308 pages And the test will be based on that e-book , you can take final test within 1 year of purchase. Cake PHP refers to a web application framework which is considered as open source. This framework is primarily written in PHP and is modeled after the most essential Ruby on Rails concepts. It should be noted that Cake PHP takes advantage of software design patterns and software engineering concepts in order for it to work as an effective model view controller, front controller, convention over configuration, association data mapping and active record framework. A lot of experts also define Cake PHP as an effective framework established on the finest programming language in the world called PHP. This framework is primarily used to build the best websites, web applications, content management systems and shopping carts. One of the major advantages of Cake PHP is that you can use it to have an easier time installing and operating software tools. It is also beneficial because it consumes the least amount of time when you are operating it while also having simple and easy to learn operations. Cake PHP is also a huge help in your attempt to easily manage the contents of your site. It also offers numerous language options, more customized templates and fields, user management features, file manager, forms, themes, RSS feeds and comments. The framework is also beneficial for developers who wish to write the least number of codes while also significantly reducing development time. It works suitably for small and medium-sized enterprises because these require low development and installation costs. You can also use the framework for blog and e-commerce sites. 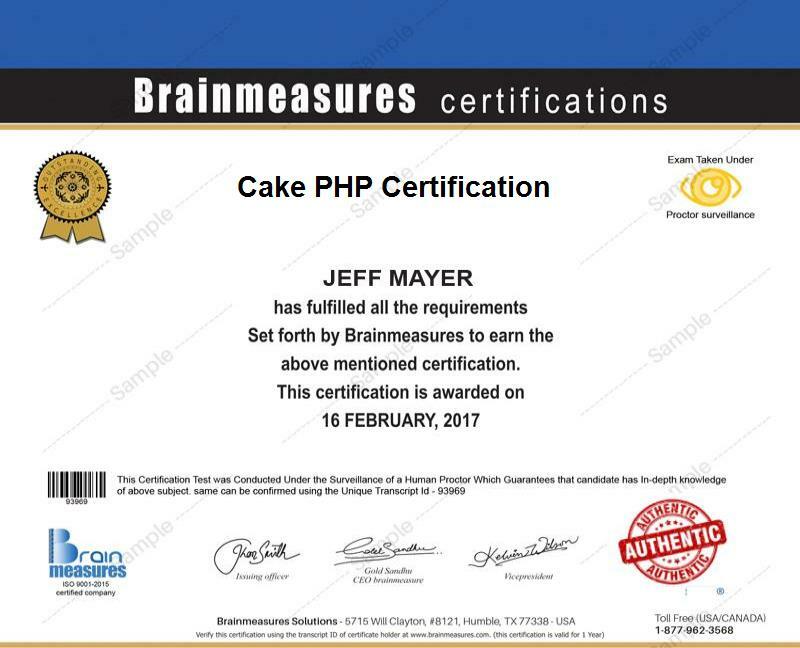 Becoming a certified Cake PHP professional is now easier with the presence of Brainmeasures, an online certification company which includes a Cake PHP certification program among its many offers. Brainmeasures Cake PHP course is comprehensively developed by real experts so you have a hundred percent guarantee that it is capable of increasing the level of your skills and understanding when it comes to using the framework. Enrolling in this online certification course gives you the opportunity to access the company’s online Cake PHP training which is guaranteed to provide you with a clearer idea about how the framework works, its major functions and roles, the different business enterprises, websites and areas that can generate benefits from it, the major features installed in the framework and how you can take full advantage of it. Receiving a Cake PHP certificate is a huge help in your attempt to instantly impress prospective employers about your skills and expertise in this field. How to create simple views and bake in the console? How to work with models and controllers? How Cake PHP benefits different types of business? The Cake PHP certification program which you can now easily access at Brainmeasures is proven to be capable of providing numerous benefits to a wide range of individuals and professionals. This program is a huge help to programmers, webmasters, web administrators, developers and any other professionals in the IT industry who wishes to develop the best websites and the most impressive web contents with the help of the Cake PHP framework. Your earnings can also be expected to grow significantly as soon as you finish a Cake PHP certification course. Holding a Cake PHP certification is a major help in your attempt to work effectively as a Cake PHP programs administrator and enjoy a more stable salary because this profession usually offers at least $58,000 every year. You can also work as a Cake PHP developer which allows you to generate approximately $56,000 to $88,000 annually.